A couple weeks ago, in the last of the Orchard Cottage summer festivities, friends from near and far gathered for a BBQ / slumber party that will forever remained etched in my memory for its three cheese plates in 24 hours. 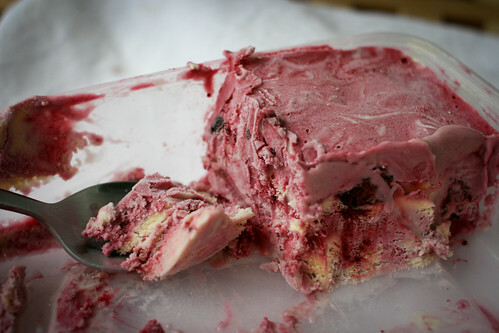 The other source of memory burn: this blackcurrant swirl ice cream. 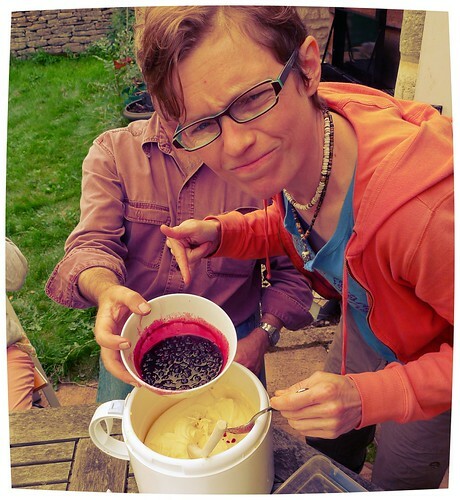 Amongst my my guests that weekend were Rachel Demuth, owner of Demuths Restaurant and Vegetarian Cookery School in Bath, who put in a request for blackcurrant ice cream. Blackcurrants are one of those British fruits that I’ve never quite got my head around (the exception being Cassis, a blackberry liqueur that works wonders with Rosé). I think I associate it with Ribena, which I’m not particularly fond of. Anyway, I like a challenge. I had some difficulty finding blackcurrants – we’re well past their season – but found some frozen ones at The Organic Farm Shop, where I also acquired the necessary milk, cream and eggs (I’m not sure why, but the farm shop’s dairy makes The Best ice cream – I think it has something to do with their super rich cream that’s almost as thick as yoghurt, and their wonderfully creamy yellow egg yolks). To make the ice cream, I adapted the recipe for Raspberry Swirl Ice Cream in the forever useful David Lebovitz book, The Perfect Scoop . Rachel lent a hand by advising on the blackcurrants, which she cooked on the stove with some sugar until they just started to burst. 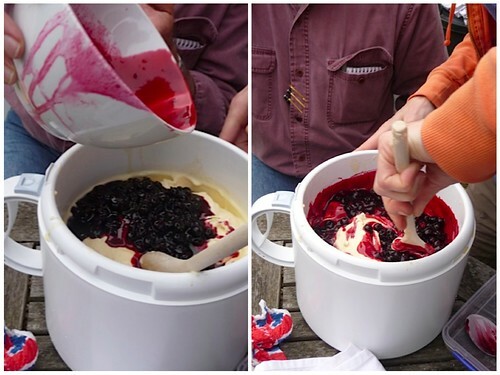 We swirled this in just after churning, though in retrospect I think I’d let the ice cream freeze a bit before mixing in the blackcurrants, just to amplify the “swirl” effect even more. So I think this ice cream has made me a black currant convert. They’re super tart, which I LOVE, especially when combined with the rich creamy sweetness of the ice cream. This recipe also has me wanting to try more “swirl” ice creams with this season’s found fruit: blackberries and elderberries I’m thinking. Stay tuned. Adapted from David Lebovitz’s The Perfect Scoop. Yield: 1 3/4 litres. To make the ice cream, warm the milk, sugar and salt in a saucepan. Pour the cream into a large bowl. Set a sieve over the top. In a separate bowl whisk the egg yolks and set aside. Slowly pour the warm milk into the egg yolks. Spoon the warm egg/milk mixture back into the saucepan. Stir the mixture over medium heat until heated and the custard coats the back of a spoon. Pour the warm custard through the sieve into the cream and add the vanilla extract. Gently mix. To make the blackcurrant swirl, add the sugar and blackcurrants with a dessert spoon of water to a saucepan. Cook the blackcurrants on medium heat, stirring constantly, until the sugar has dissolved and the blackcurrants begin to burst. To finish, churn the cooled custard in your ice cream maker for about 20-30 minutes. 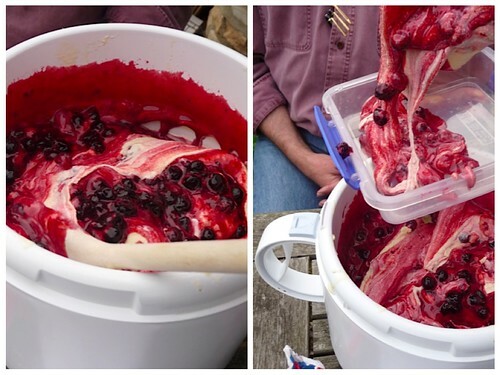 When done, add the blackcurrant, swirl once or twice, then remove to a freezer-proof container (do not overmix!). 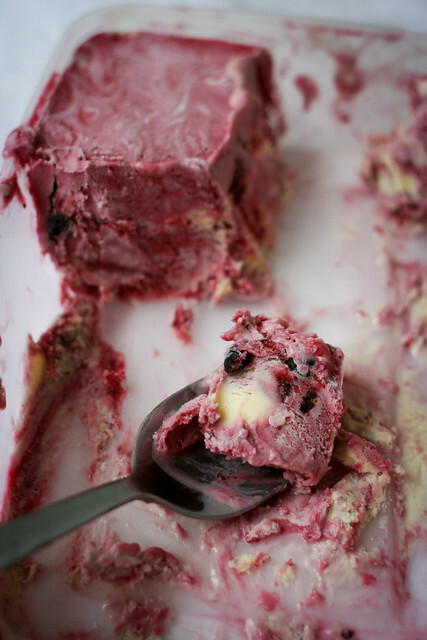 Click to read Rachel’s write-up of the Blackcurrant Swirl Ice Cream. Yeah, I always associated balckcurrants with Ribena which I detest until a couple of years ago in France when I realised that Ribena tastes nothing like the real thing (it needs to taste more like Cassis!). This summer I baked with them a lot and they are growing on me more and more. 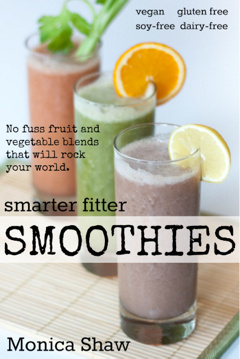 This is bookmarked for next summer for me – looks amazing!